many seem to celebrate this season as though He did. 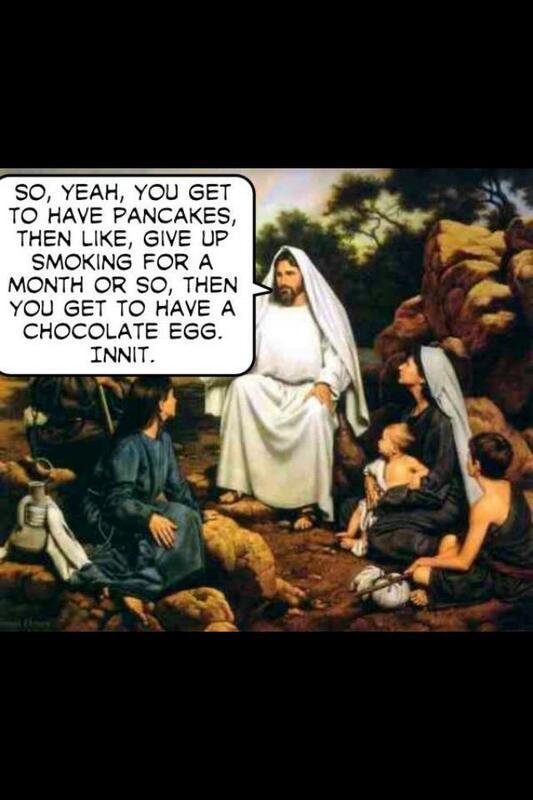 So, if I understand this correctly, during Lent, one of the activities is fasting. The idea seems to be that you have to give up something, often food, in order to somehow be better able to celebrate Easter (???). And, since there is that fasting of Lent coming, during Shrove one of the activities is feasting (often on pancakes), or the proverbial “pig-out.” (Yes, I am being facetious). Recently I mentioned to a couple people that I had only heard the word “Shrove” for the first time two years ago. They seemed rather surprised at this, given that they knew about my Theology background. Now, in all fairness, I may have heard it in some lecture somewhere, but obviously, if I did, I either didn’t view it as important, or it was simply one of those things that went in one ear and promptly out the other. When I explained to them that the word “Lent” and “Shrove” was not in the Bible, they seemed almost to disbelieve me. In the end, I think I helped them come to see that these were simply traditions of men. I thought of actually going a step further and saying that even the word “Easter” is not in the Bible either, but that might have been pushing it. Now traditions are not necessarily a bad thing. Like most people, we have a few things that we do as a family which have become sort of traditional. They can actually be fun. I remember when our kids were small, one of the things that we often did on long weekends, when we didn’t have school or work the next day, was to have a family slumber party. We would lay out air mattresses and sleeping bags on the floor, rent a few good movies, stock up on chips and cookies and pop, and have a family movie night. It was a lot of fun for all. Those days are long gone, but when the kids come home for a few days, we still love to play cards and do things together. I suppose it is tradition. The problem is when traditions, especially in the church, cloud the truth of the Gospel message. The Pharisees in Jesus’ day were big on traditions, and many modern day Pharisees are equally big on them. In speaking about his own background before his conversion, Paul confessed that, “I was advancing in Judaism beyond many Jews of my own age and was extremely zealous for the traditions of my fathers” (Galatians 1:14; NIV). When some Pharisees questioned Jesus about his disciples breaking the tradition of hand washing, Jesus said, “And why do you break the command of God for the sake of your tradition” (Matthew 15:3; NIV)? Therein lies, I believe, the key for us today as well. Are we breaking any of the commands of God with our traditions? If so, there is a problem. If not, then it is no big deal one way or another. In my way of thinking, the only commandment that matters now is “The Greatest Commandment.” What is that? Jesus said, “You shall love the Lord your God with all your heart and with all your soul and with all your mind. This is the greatest and the first commandment. And the second is like it: You shall love your neighbor as yourself. On these two commandments depend all the Law and the Prophets” (Matthew 22:37-40; ESV). Is this our primary focus? If so, then that’s great. If, on the other hand, we focus more on man-made traditions than the Greatest Commandment, then I would argue we have a problem. I like how Paul of Tarsus put it. He said, “Formerly, when you did not know God, you were enslaved to those that by nature are not gods. But now that you have come to know God, or rather to be known by God, how can you turn back again to the weak and worthless elementary principles of the world, whose slaves you want to be once more? You observe days and months and seasons and years! I am afraid that I may have labored over you in vain” (Galatians 4:8-11; ESV). So what is this “Lent” and “Shrove” thing? They are nothing more than some of the many traditions of men that “some” in the church have embraced. Facetiously I called this post Church Tradition Number 14,073. I don’t know how many man made traditions there are in the church. Suffice it to say that there are lots. At the end of the day, I suppose it comes down to this: “One person esteems one day as better than another, while another esteems all days alike. Each one should be fully convinced in his own mind” (Romans 14:5; ESV). “The faith that you have, keep between yourself and God. Blessed is the one who has no reason to pass judgment on himself for what he approves” (Romans 14:22; ESV). So if you think you have to fast and give something up before you can pig out on those chocolate eggs, go ahead; knock yourself out. What it really comes down to is, to each their own. I agree, Pam. Fasting is wonderful if and when it is Spirit led; not when it is man dictated based on tradition. Thank you for your comment. Blessings.